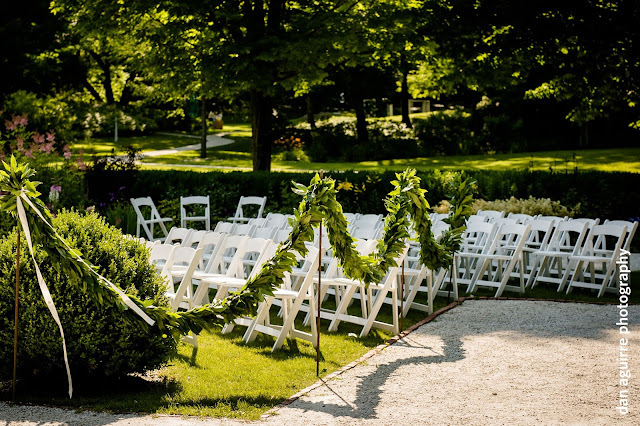 While we can't yet share the awesome photographs from Parris Whittingham of Jacqueline and Kelly's gorgeous September wedding at The Mount, we can share their wedding video from Velare! 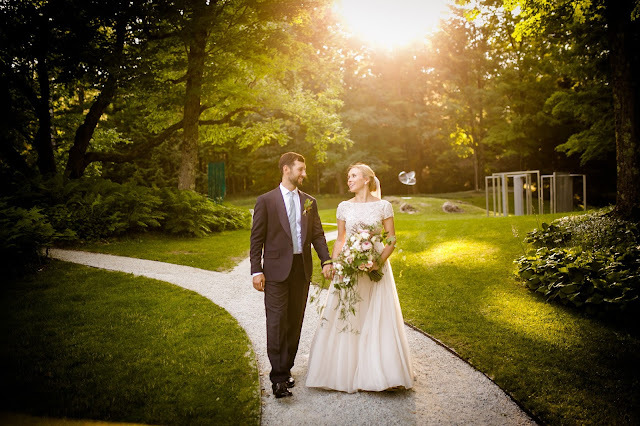 Watch it below and stay tuned for more on their wedding and other weddings in the Berkshires soon. jacqueline // kelly - lenox, ma from VELARE on Vimeo. 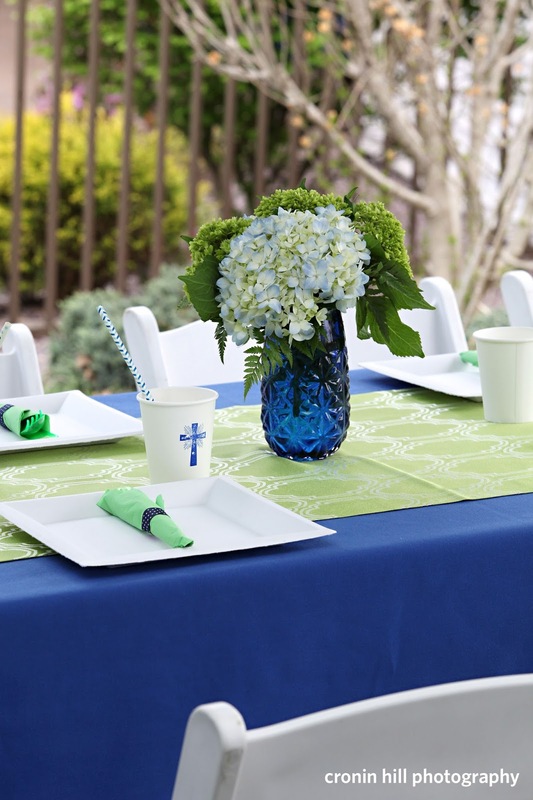 A first communion is a landmark celebration in the lives of many young boys and girls. 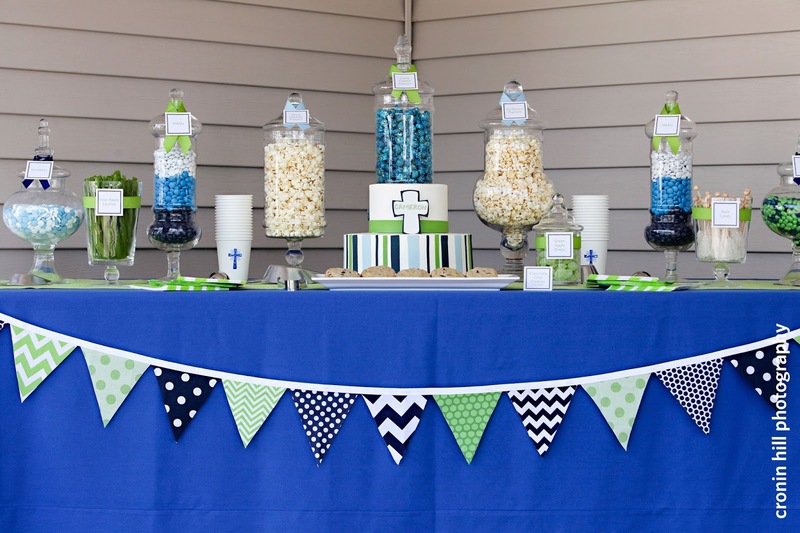 While the ceremony itself is a cause for celebration, it is often the party afterwards that family and friends look forward to. We were excited to help Liz with this special celebration, as we had helped her plan and design her eldest son's communion a few years earlier. 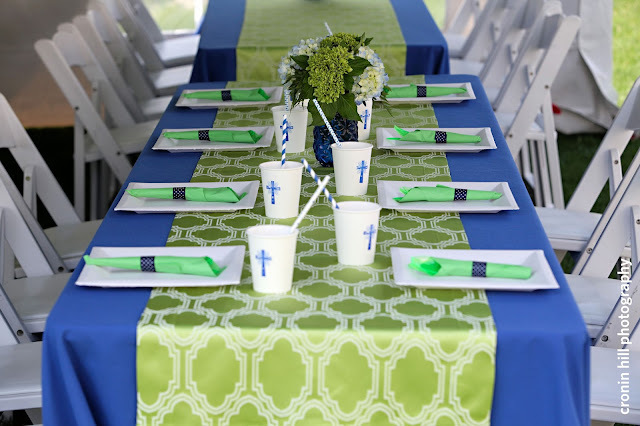 Using pattern, texture, and pops of royal blue and lime green, we created this fun and festive backyard celebration for their closest family and friends. 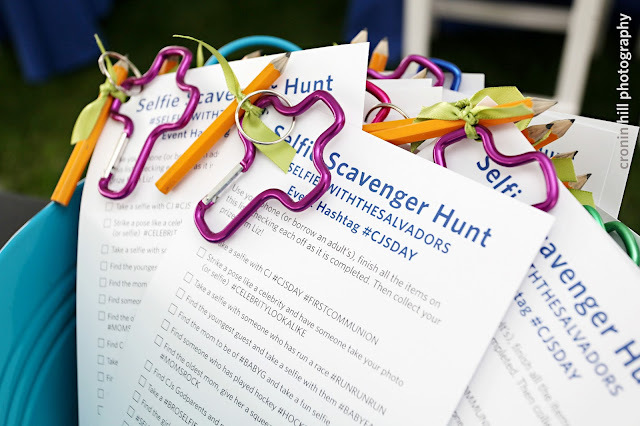 We custom designed the invitations, hand stamped paper cups, wrapped dozens of green flatware in napkins with ribbon, created a yummy candy and popcorn buffet, designed signage, and made a fun selfie scavenger hunt. 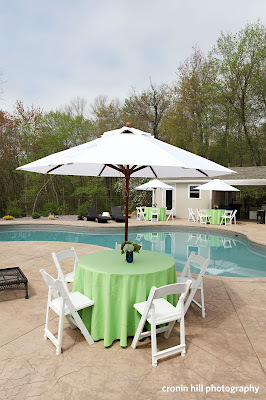 After setting the tables and putting the finishing touches on the tent and pool areas, we left the guests to enjoy the fabulous food from Lattitude Restaurant. 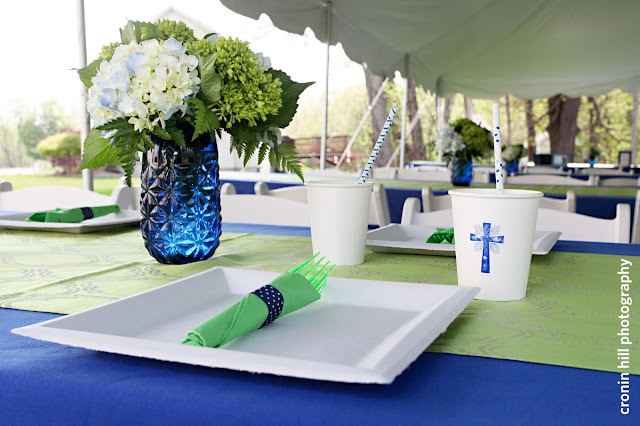 Also thanks to Michael's Party Rentals, BBJ Linen, Durocher Florist for the beautiful flowers, and Cakes by Amanda for the cake and chocolate chip cookies. 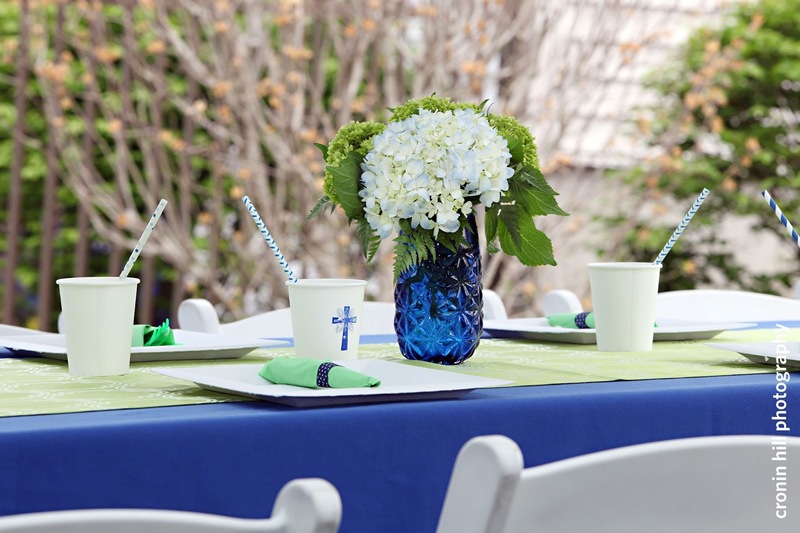 Here are some of the details of this backyard celebration as seen through the eyes of Cronin Hill Photography. With many couples becoming recently engaged over the holidays, we have been flooded with lots of questions: What should I do first? When should we send out save-the-dates? Can my friend marry us? 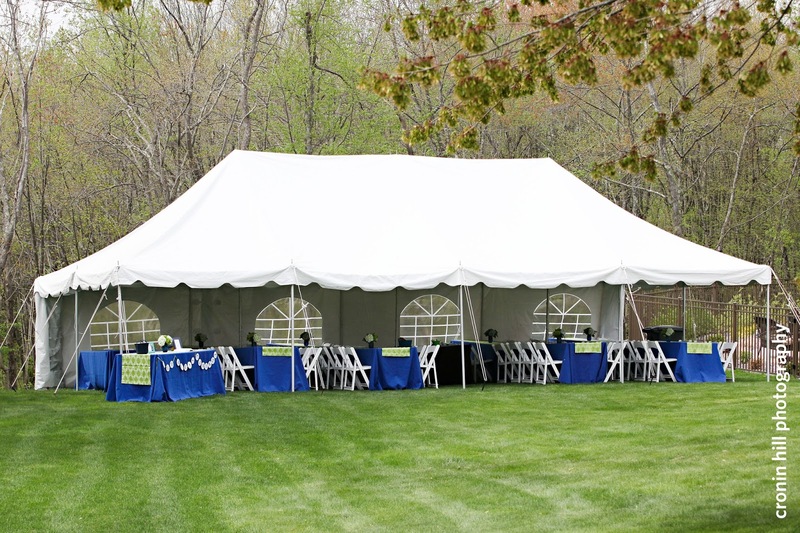 Should I have a tented wedding at my uncle's house? Let's start with a question we received from one of our clients just yesterday – "How do I select bridesmaid dresses for my bridal party? 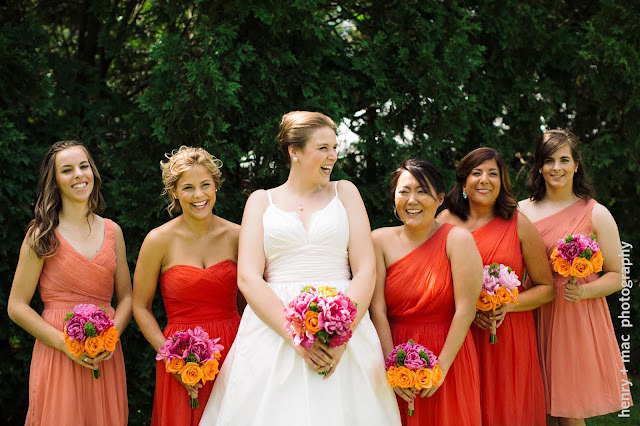 I have ten bridesmaids, and they all have different body types and style preferences!" If your wedding is in November, you probably don't want to pick a dress that is tea-length and strapless – unless of course you live in a warm climate or are having a destination wedding. Dresses that are heavy or have many layers should also be avoided in warm months. You can opt for a bolero, shawl, or pashmina to cover arms and shoulders in months that may have warmer days and cooler nights. If your wedding is a tented backyard affair, complete with lawn games and a pig roast, you probably don't want to pick a ballgown style, or a glitzy, beaded dress. Take into account the type of fabric the dress is made from as well. Find a style or styles that compliment your attire, but make sure it isn't too similar. 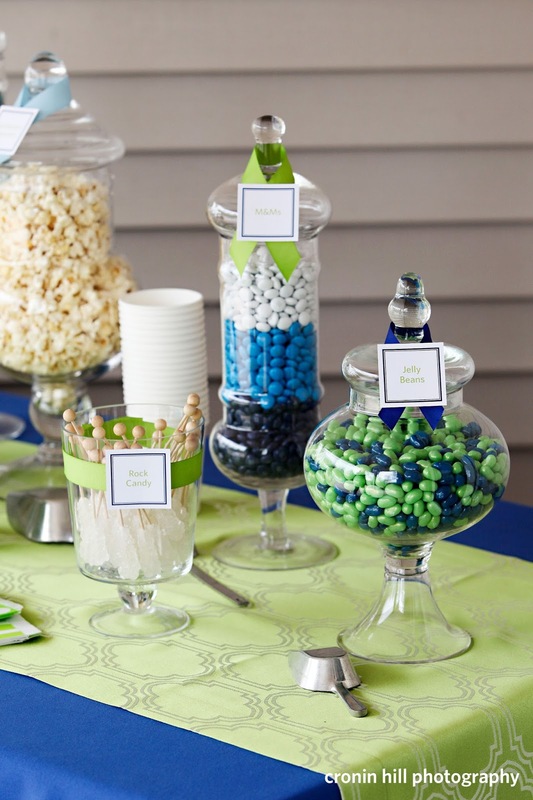 It's hard to please everyone, especially when you have a large bridal party. 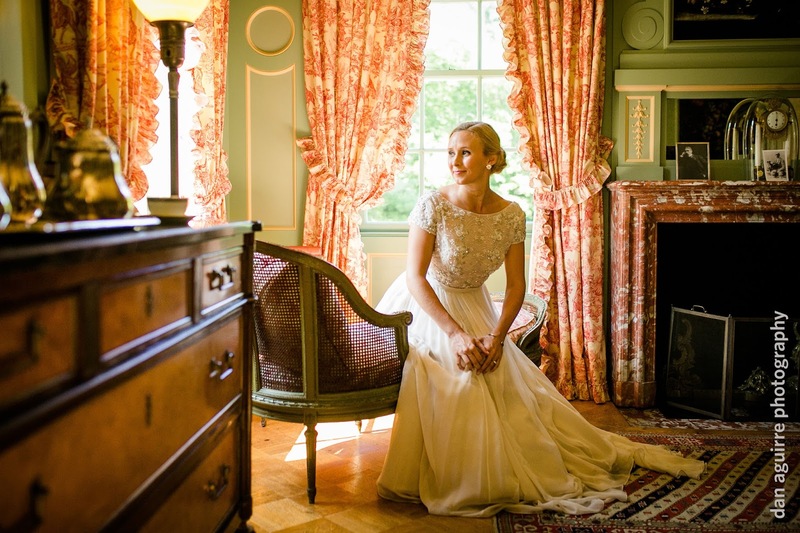 Try to select a line of dresses that offer similar styles with varying necklines. 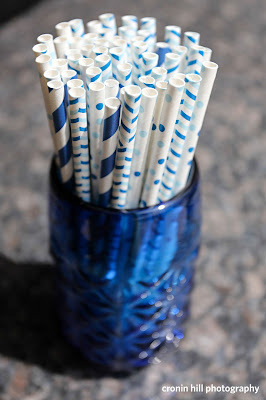 This will allow your bridesmaids to pick a dress in the color you want, but in a fit that works well for them. You can also select a color, and have them pick a hue in that range. 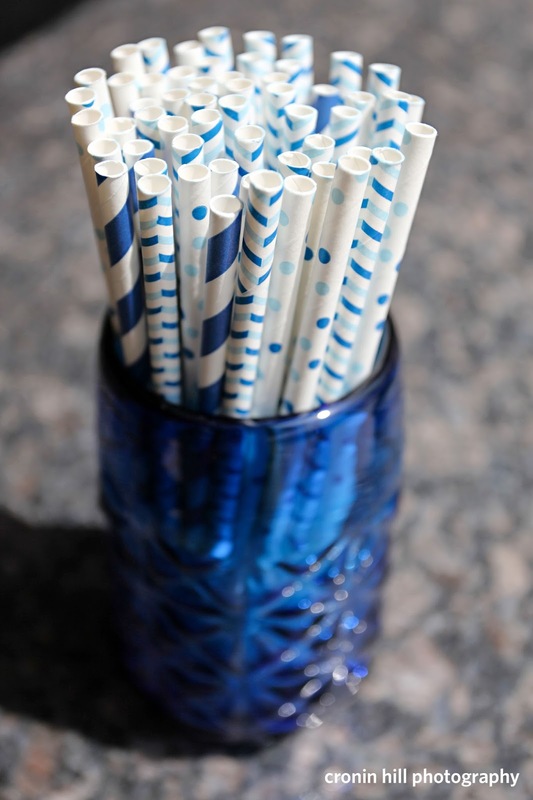 This also allows for your bridesmaids to purchase attire that not only fits their body, but fits their budget. 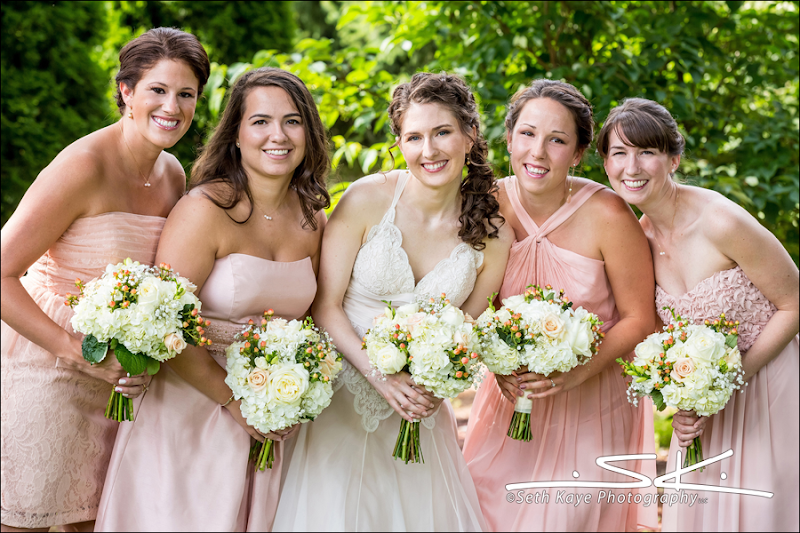 For example: A blush pink, as seen in this picture of Kristen's bridesmaids. This same logic applies to not only dresses, but also to jumpsuits or traditional two-piece suits for both men and women. Maybe you have your heart set on your bridesmaids all wearing the same outfit, so what should you do then? Select a silhouette that works well for most people, such as an empire waist, maxi, or A-line style. You should also avoid strapless dresses if any of your bridesmaids are large chested, or select a dress that has the option of removable straps. Ask them to go shopping with you, but don't bring them all at once. It's hard to decide when you have 10 varying opinions. Instead, shop with 3 or 4 of them at any one time. Rent a bridesmaid dress? You sure can! Check out Rent the Runway, an online retailer that rents high-end dresses, skirts, and accessories for any occasion. 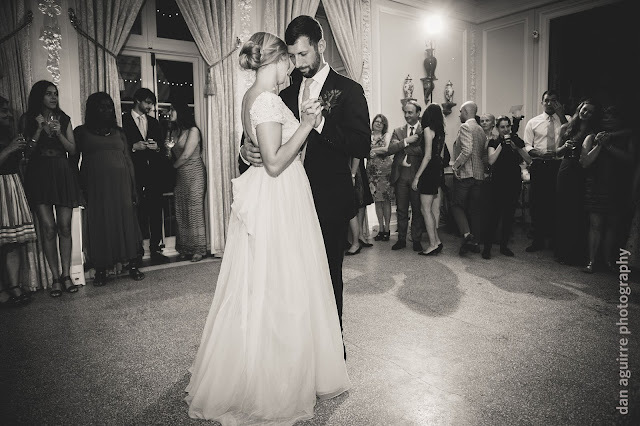 Never thought it was possible for your attendants to wear the likes of Badgley Mischka, Monique Lhluillier, Reem Acra, or Vera Wang at a price you or they can afford? Here is your solution! You can rent the garment for 4 or 8 days, and select up to 2 size options, or even choose a second style. After the event, it's free shipping back to them and you don't even have to clean it! They handle the cleaning for you. We suggest you do a test run with a dress or two before you commit to this option. 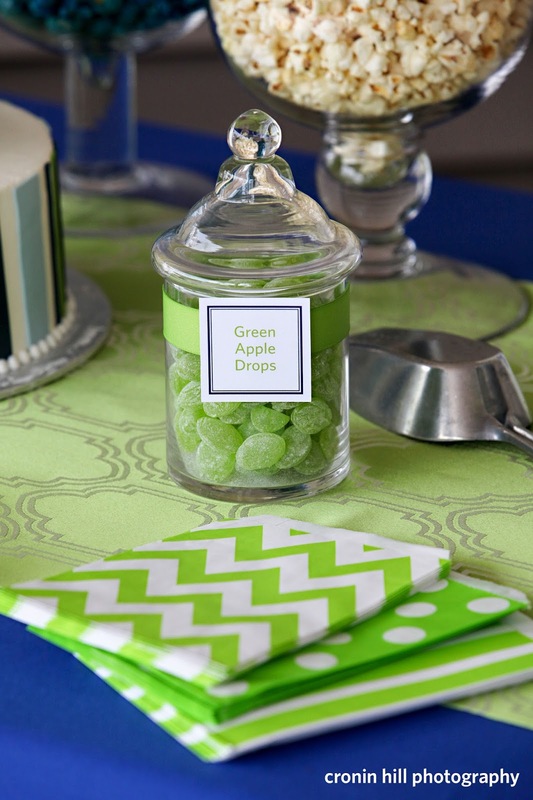 Stay tuned for more planning tips and etiquette guidance in upcoming blog posts. We will try and post answers to your burning questions a couple times a month. 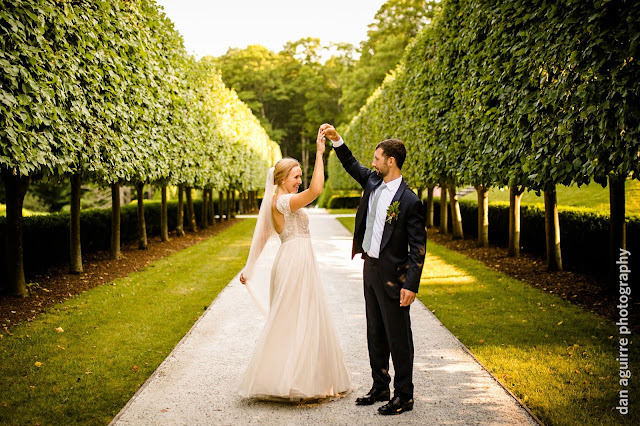 Caroline and Josh had one of the most picturesque summer days for their wedding at The Mount in Lenox, MA this past July. If you have never been to The Mount, you should definitely visit. 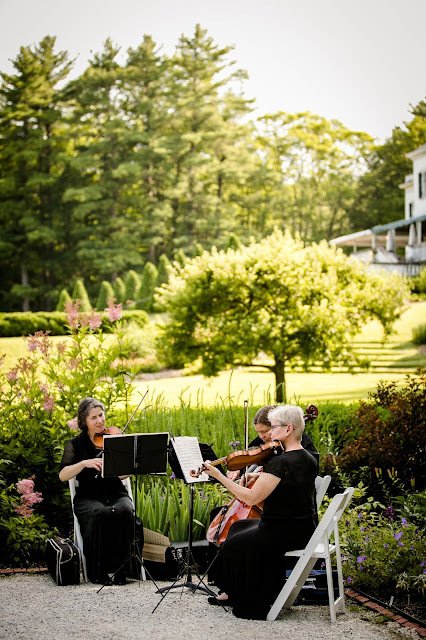 You can tour the historic home of author Edith Wharton, enjoy the beautiful gardens, talk a stroll down the lime walk, sit on the terrance overlooking the property, or enjoy free jazz concerts that are hosted throughout the summer on Friday nights! 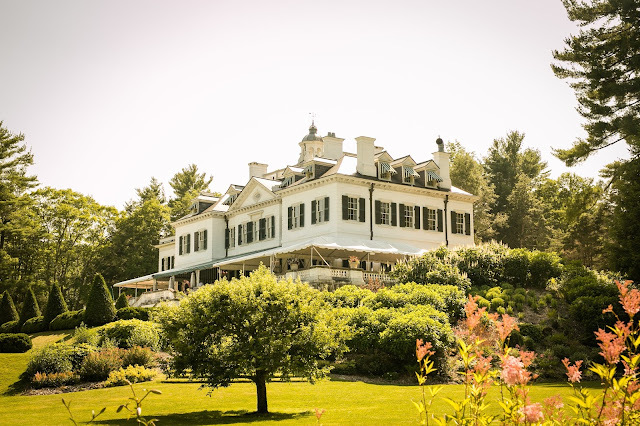 A landmark of the Berkshires, The Mount is one of our favorite locations. 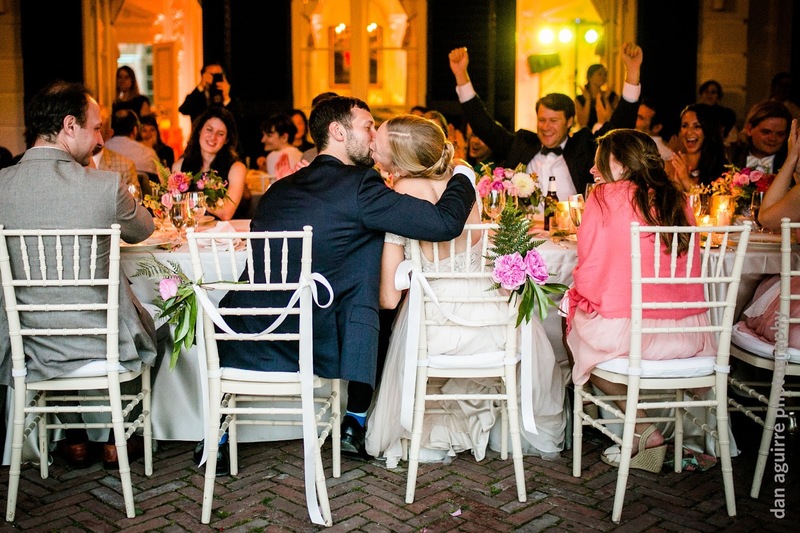 The ceremony took place in the English garden, followed by cocktails in the walled garden, and dinner on the terrace. 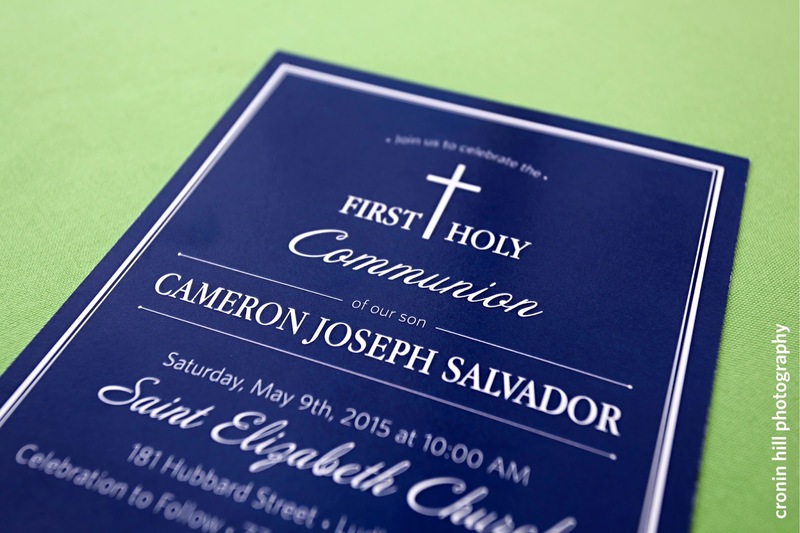 We helped them design and create their wedding programs, which complemented the look of their wedding invitations. The always beautiful arrangements and candles from Crocus Hale Flowers spanned the long line of dining tables on the terrace while the delicious food by Max Ultimate welcomed guests to their seats. Music from the Rosamund Trio played during dinner, and afterwards, the party was brought inside where guests danced the night away to tunes by the Bob Charest Band. 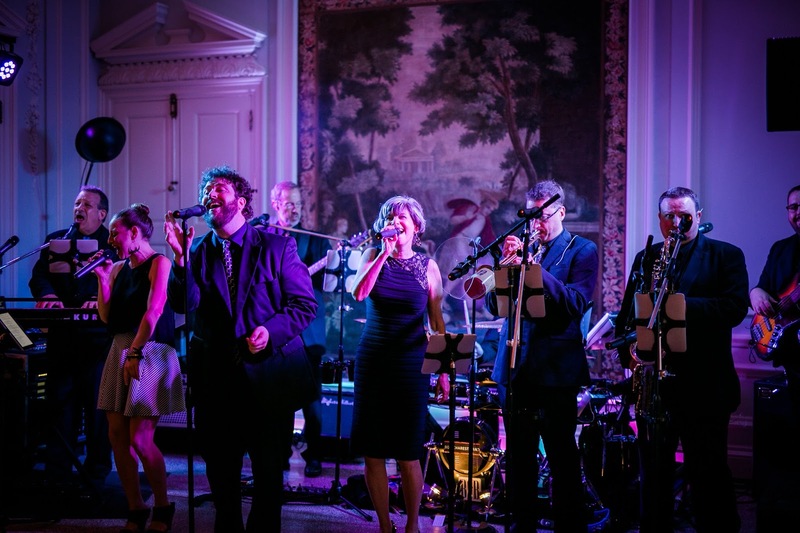 They are one of the best wedding bands we have ever worked with, and I don't think one person sat down all evening. An after party was thrown at a friend's house nearby, and at the end of the evening, the shuttles brought all of the guests there to continue the celebration. 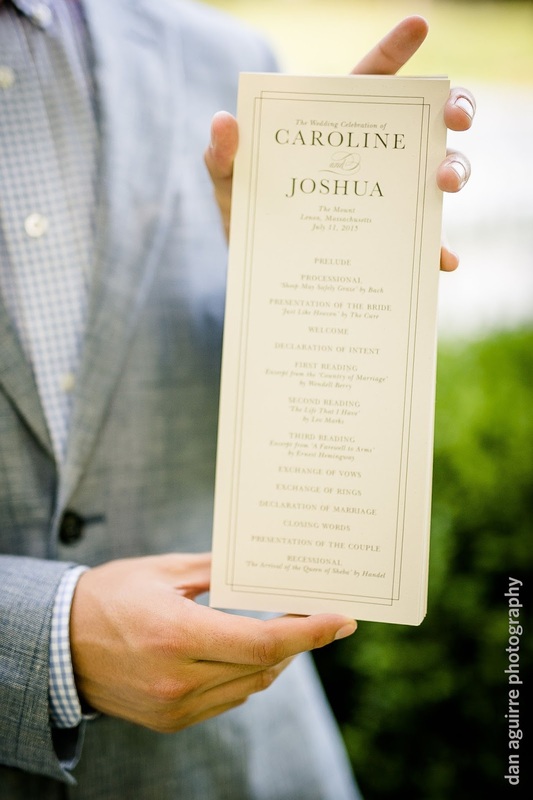 Check out some of the photos from Dan Aguirre Photography of Caroline and Josh's big day! 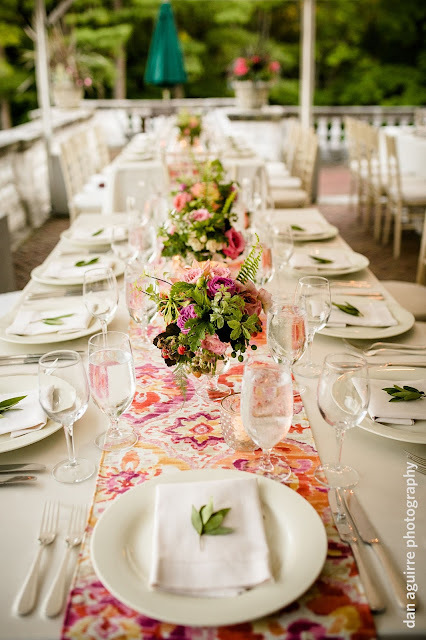 Looking to host a wedding or event in the Berkshires and need some assistance planning, designing, or coordinating it? Contact us and let's get this party started! More pictures of this wedding and other weddings we have done can be found on our website. We're very fortunate to have some fabulous media sponsors for Eventiques Flea Market this Spring. 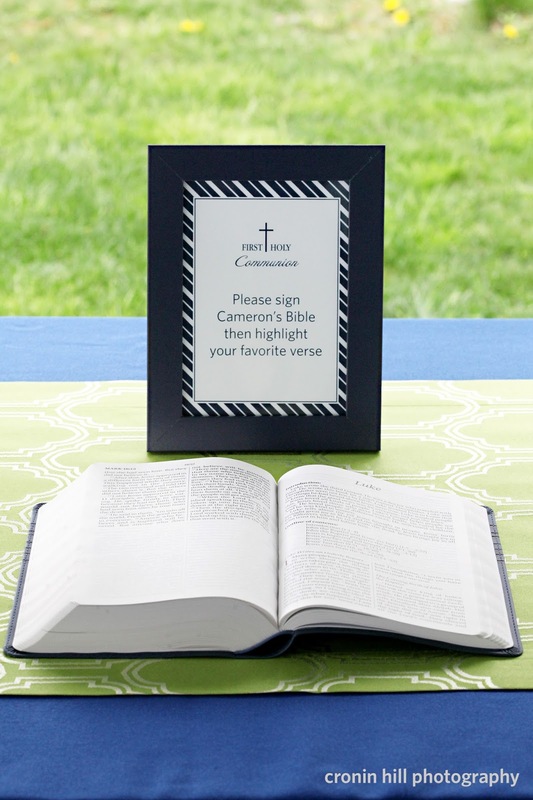 WellWed magazine has been publishing books filled with gorgeous weddings and inspiration for years. We're so grateful to have them as a media sponsor for Eventiques Spring 2015! 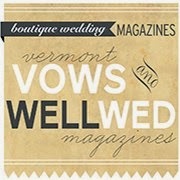 WellWed offices are located in Burlington, Vermont but they have Magazines throughout New England. They own Vermont Vows, WellWed New York, WellWed The Cape and Islands, WellWed The Hamptons, and WellWed Maine and New Hampshire. You can flip through one of their issues here. VIP Ticket holders will get a copy of this magazine in their Swag bag at the event. 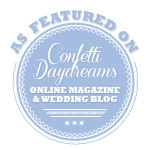 A beautiful book full of inspiration and gorgeous real weddings! What a treat! 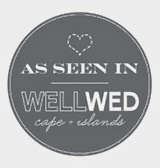 Here a just a few samplings of the weddings that have been published by WellWed. 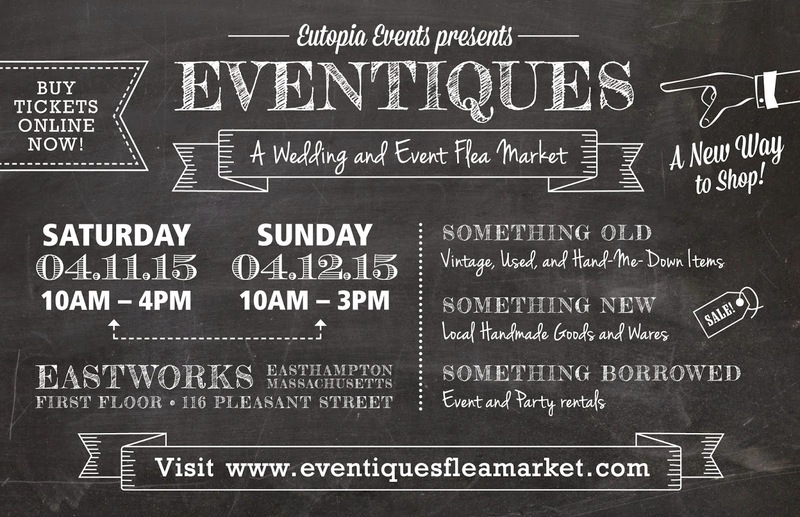 Eventiques Flea Market is this week and we can't wait! We have already begun our event set up and we'll be putting together some beautiful displays in addition to putting out all of the wonderful inventory for sale. Doing an event like this would not be possible without the involvement of some pretty spectacular sponsors. We are thrilled to have some talented professionals on board for our April 2015 event! 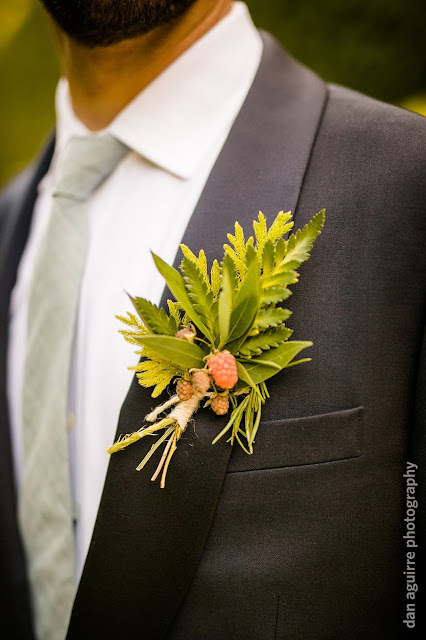 We limit the event to one sponsor in each category with exception to the florists. The vendors we ask are those that we trust and have worked with previously. This way, we know that you are given the opportunity to meet the best in the area! 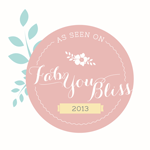 These are some of the people who can help make your wedding or event impeccable! Cronin Hill Photography will be providing photography coverage for the event throughout the weekend. All of the photos you see on our website and facebook from past events have been taken by Cronin Hill Photography. Not only are Paula and Rick talented wedding and event photographers, they are two of the sweetest people you could ever work with! They make you feel as though you are having your pictures taken by two of your closest friends. In fact, they take our family pictures and as well as capture memories from our own event! They are friendly, funny and easy going. They care so much for their clients and it shows in everything they do. 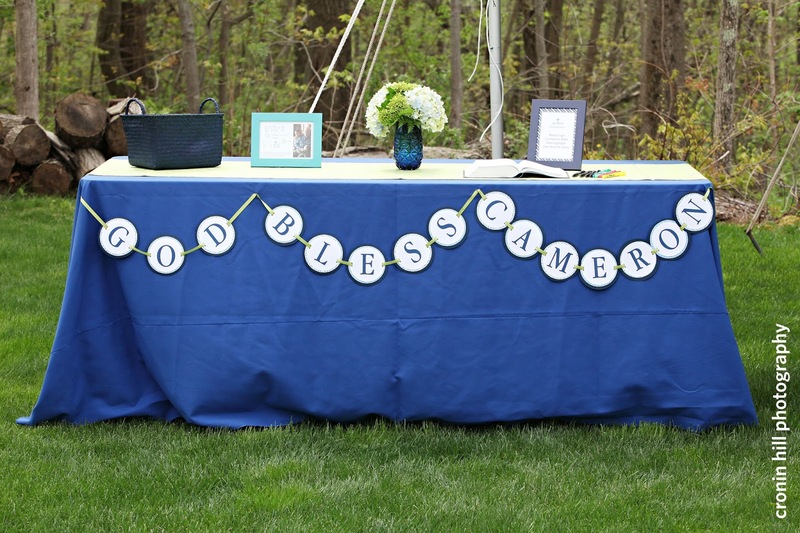 They've worked all over New England and beyond, their photographs are amazing and we always love working with them on any wedding or event! Cakes by Amanda is owned by Amanda Russell and to say that she is talented is an understatement! 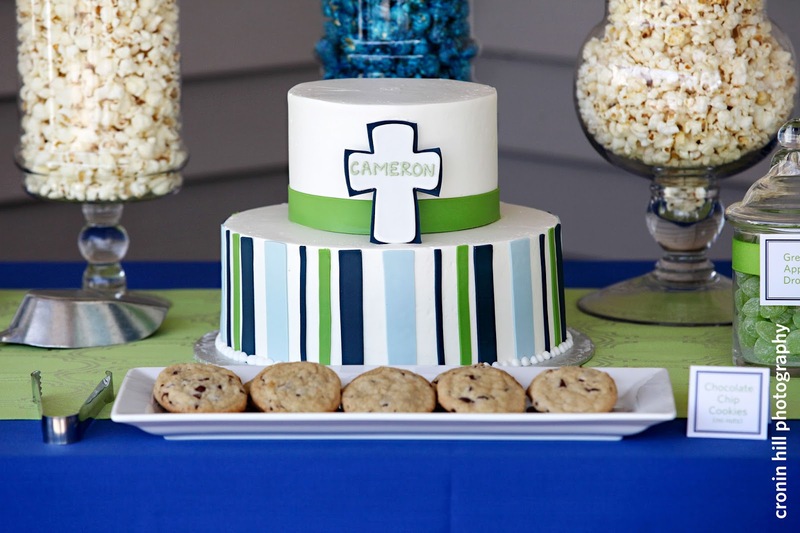 Her cakes and desserts not only look phenomenal, they taste fantastic!! We've known Amanda for years and have seen her business grow. She opened her own bakery in Barre, Ma last year and it has been incredibly successful. She's professional, fun and creative. She will be displaying some of her cakes at the event as well as providing some nibbles for attendees to enjoy. 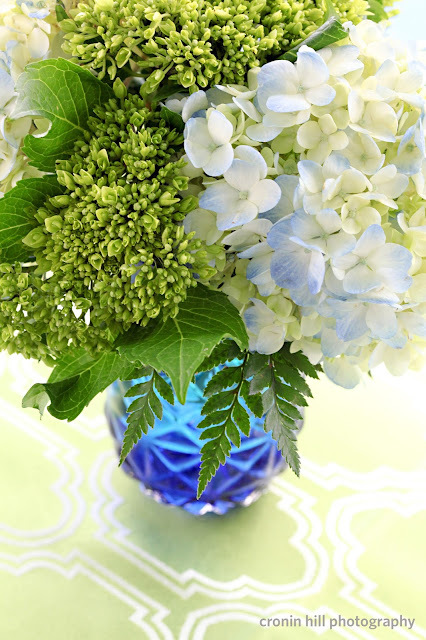 Durocher Florist is another incredibly talented florist who has been designing and delivering flowers since 1948! 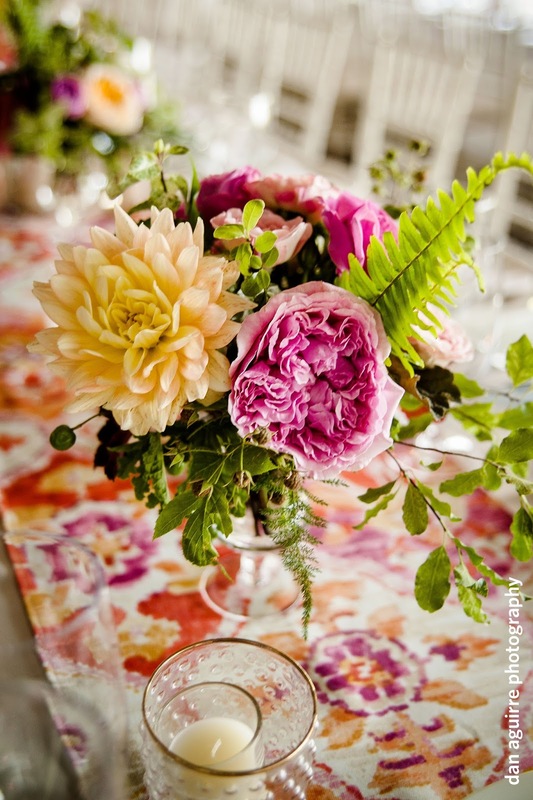 Hundreds of flowers have passed through their shop and each piece is a work of art. They are professional, and work with your vision to make it come to life. We love working with this talented group! Daisy Stone Studio is a boutique floral and event design company. 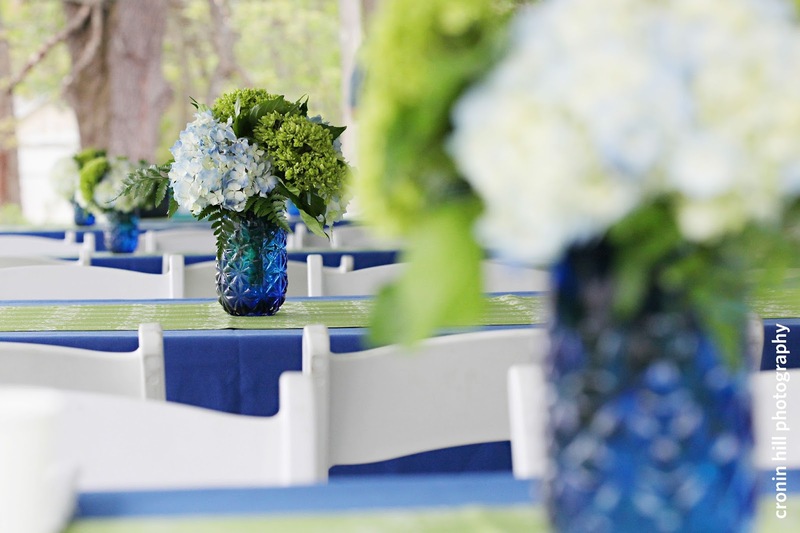 They love to enhance any event with flowers as well as other decorative elements, creating a cohesive and beautiful design. Owner, Susie Hanna received her Certification in Floral Design from the New York Botanical Gardens and has worked in New York City, San Francisco and currently Western Massachusetts. Susie and her team pride themselves in providing excellent service for an unforgettable experience. 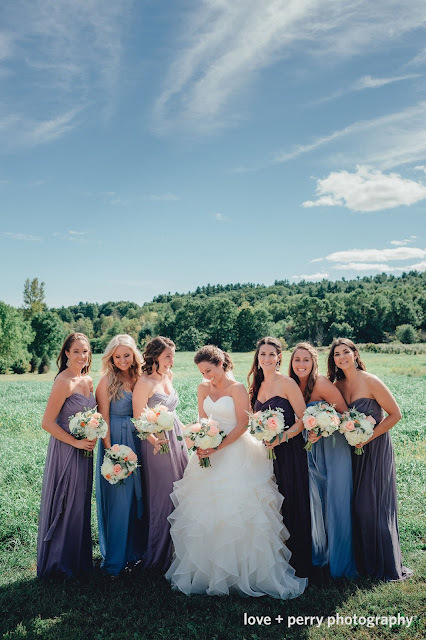 Forget Me Not Florist in Northampton has been creating gorgeous floral arrangements for weddings small and large throughout the Pioneer Valley. 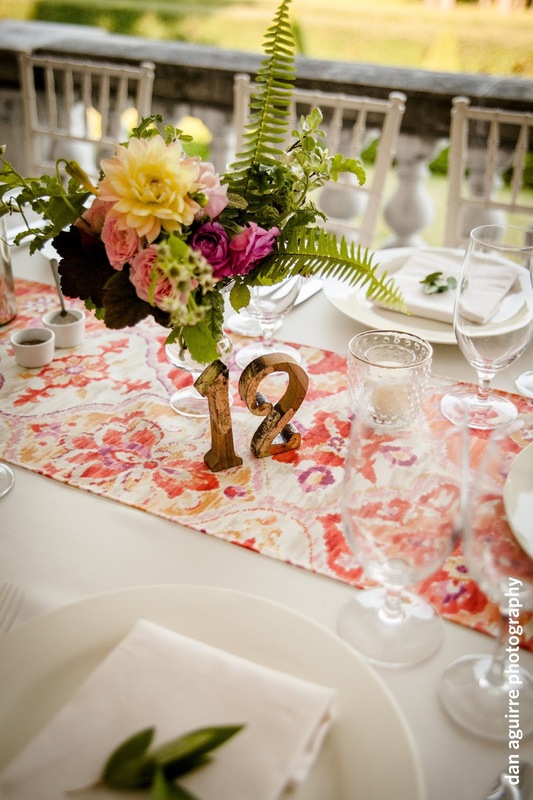 When it comes to floral designs, we know Rebecca and her staff will exceed our expectations and produce stunning arrangements. We've seen their business flourish over the years and enjoy working with them on weddings and events. If you need rentals for your wedding or event, Michael's Party Rentals is your company! We've worked with them on events over the past 5 years and we are always impressed by their customer service, the quality of their items and their professionalism. We are honored that they have joined us as a 2015 Sponsor of Eventiques. You do not want to miss out on seeing some of their incredible inventory and talking with them about helping you with your rental needs! 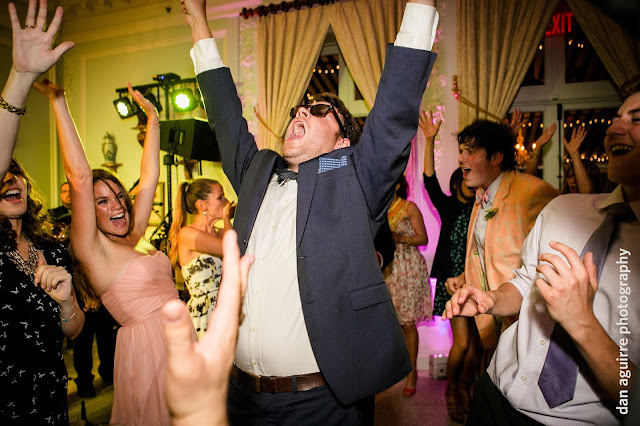 We're thrilled to have JPod Productions as the official Eventiques Videographer. They have won awards and produce wedding films that are heartfelt. Jamie and his staff are professional, courteous and super friendly! They'll be onsite covering the event but they'll also be available for questions about Videography for a wedding or special event. We've seen some of their family films too, perfect for a milestone birthday, a mother's day gift (as mothers ourselves, we would love a gift like this! Husbands, take note!). As Event Designers, we know the value of really good lighting and how it can dramatically transform a space. CJC Event Lighting has been providing specialty lighting for weddings and events all over New England for years. We're honored to have these talented and seasoned professionals as a sponsor this May! 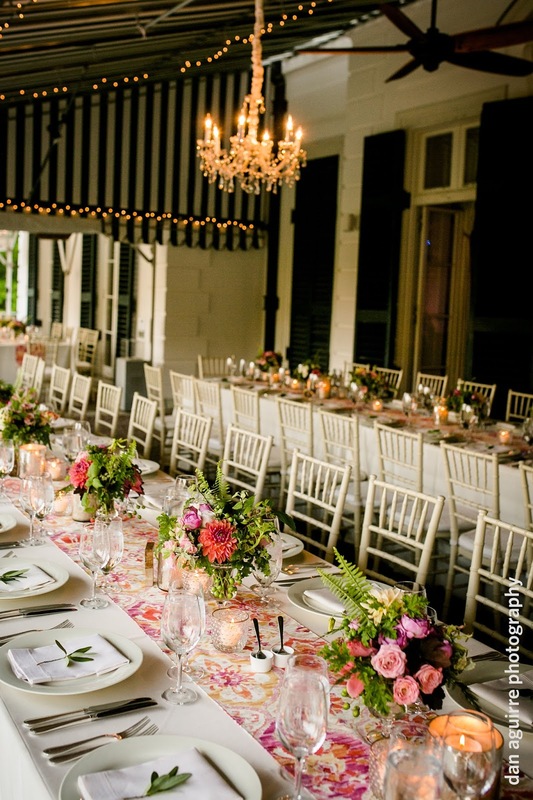 They push the envelope when it comes to lighting, keeping things fresh and new! 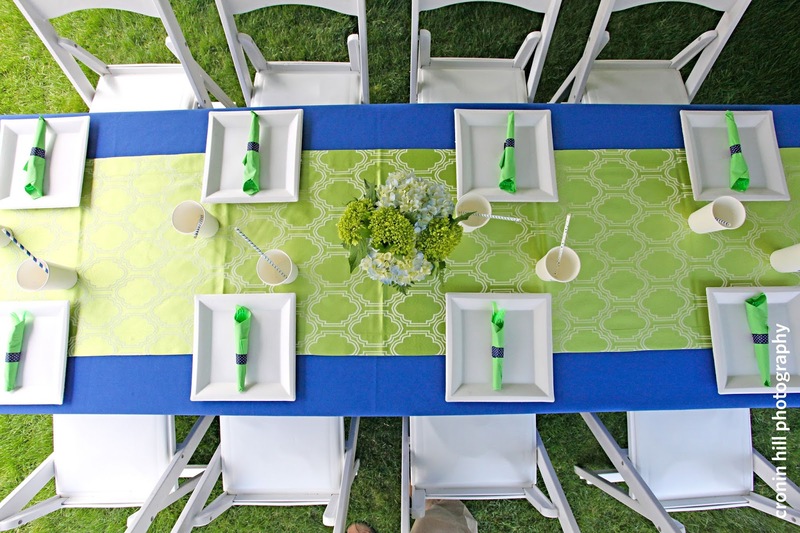 We are excited to see what they come up with for our event space! Rum and Steel will be providing some fun sounds on Saturday morning! They are a steel drum and guitar duo based in Western Mass. Their upbeat music is great for a cocktail hour, private parties, or rehearsal dinners. Enjoy shopping while listening to a taste of the tropics. Viren Entertainment is owned by Shawn Santanello. He provides entertainment as a DJ but also plays acoustic guitar. We have worked with Shawn many times over the past few years and every client has raved about him! We are so fortunate to have such a talented DJ/Musician in our circle and we love recommending him. He is fun, sweet and really easy going. We love that he has offered to provide musical entertainment once again at Eventiques. We look forward to having him! Lattitude Restaurant and Events is a full-service restaurant and catering company that houses a brick wall and steel beam event space, perfect for any occasion. They are also a preferred caterer for many local traditional and non-traditional venues, and highly skilled in special menu restrictions and diets. We will also be welcoming Western Woods Coffee to Eventiques Spring 2014. The owner, Patrick, will be at the event providing delicious coffee samples to guests. He provides exceptional coffee service for weddings and events, a unique and special service that will surely impress guests! You can visit our Sponsor page on Eventiques Website to read more about each of these sponsors. You can also visit our Facebook page to see images of their work.